Whether it's recording a telephone number when the phone book is far away, saving an URL to reuse, writing a simple TODO list or collecting some information, there are lots of examples. And just as many solutions: open Notepad, use a personal information manager, or use some other programs for creating and saving text. But all those options are slow. Even a PIM is a "heavy" class program. And before you use it to make rough notes, you must create a new file or find a place to write without creating a "litter" of files or damaging important work. Flashnote is a quick notes manager created for such cases. When you need a rough copy to save or to process some pieces of a text, Flashnote is small, quick and convenient. Press the shortcut-key combination and a rough copy is on the screen in a flash of a second. Press ESC and the program hides. It's that simple. You don't need to find a place for text, to run Notepad or huge heavy PIM. Flashnote is a lightweight notes manager, everything gets done quickly, simply and in a more convenient way. 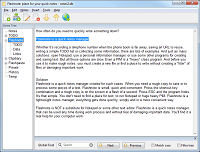 Flashnote is NOT a substitute for Notepad or some other text editor. Flashnote is a quick notes manager that can be used any time during work process and without fear of damaging important data. You'll find it a real help for your computer work. Flashnote avaiable in: Arabic, Belarusian, Chinese (Simplified), Czech, Danish, Dutch, English, Farsi, French, German, Greek, Japanese, Norwegian, Polish, Portuguese(Brazilian), Russian, Spanish, Turkish. As a CEO of a large company, I have been using Flashnote for some time now and I find it absolutely indispensible for managing all the information which flows across my desk. A simple "ALT+S" and it literally flashes up on my screen in less than a second -no loading-up delay, no opening files. It's just there. Often my staff aren't even aware that I have already noted something during a discussion. I completely endorse and recommend this simple but effective note-taking tool. At the very least try it for a few hours. I guarantee you'll never remove it again! Like a lot of other people I guess, I use and enjoy "Flashnote" since a long time (well, since the first version I think). I find it a great idea, and in my opinion the best way -in the freeware market- to save notes and reuse them. In the general market U do not find such a product, simple, alone -not "attached" and depending to another big one-... Now, with version 1.5, the sofware entered the sender of professional softwares, those ones you must count with, a "must have", and not only at home, I use it at work and make a great profit of it. It is very usefull, secure, not ram-eater allways present when U need it. Flash Note: Not a Notepad but better and faster!